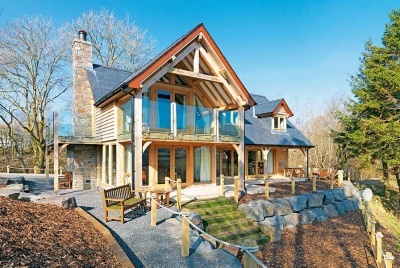 Terry Morgan has built a charming oak framed cottage his fourth self-build on an incredibly tight budget of just £134,000. On a remarkably low budget, Terry Morgan has shown what can be achieved if you have good local contacts, shop around for the best prices and use a simple but effective design. For he has built a 174m², four bedroom house in a Conservation Area in one of the most expensive parts of the country an Oxfordshire village for just 134,000. 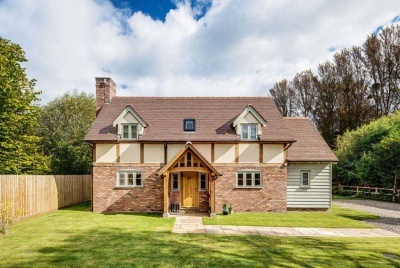 What is more, he has added a number of traditional characterful features normally reserved for builds with bigger budgets to the brick and rendered cottage-style home, which has a roof of handmade clay tiles and an open-sided oak framed porch that adds greatly to the rustic appearance. The house gains an additional traditional feel to the exterior by a 600mmhigh canted brick plinth, while at first floor level there is a prominent band which runs right round the house that is designed to add interest. The house stands on a plot measuring 32m x 17m considerably more than might be expected from a similar-sized developer-built property on a large estate and backs onto open fields at the south-facing rear; it replaces an unappealing 1950s bungalow which sat formerly on the site. Four-time self-builder Terry and his partner, Sarah Lay, plan to reside in their new home for the foreseeable future. 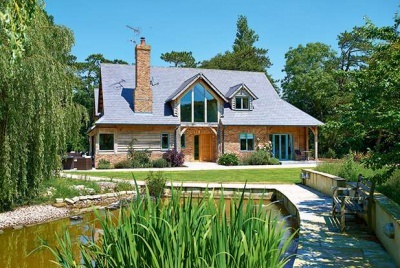 Keen to design a house that, as well as gaining the approval of the planners and local residents, would fit in with the feel of the attractive village in which it is situated, Terry opted for a rendered exterior rather than all brick, because he wanted to experiment as well as keep costs down. For the brick plinth he chose the handmade bricks very carefully, and spent a long time finding roof tiles that match the colour almost perfectly. 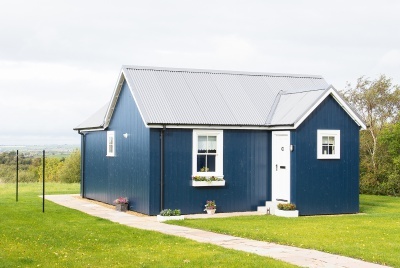 “I was keen the house should, as far as possible, not look brand new, and be more suited to the site than the bungalow it replaced”, says Terry, who trained as an architect and now runs his own home property restoration and design and build company. The first floor protruding band was achieved quite simply: Terry instructed his brickies to use 125mmrather than 100mm-wide blocks. These were then damaged slightly at the edges, and the render applied in the same way as it was to the rest of the wall. Upstairs, Terry has continued the traditional look in all the white door linings, which have square stops on the bottoms of the architrave. The doors throughout are made from oak and furnished with hand-forged Suffolk latches. I was wondering what Tiles, Bricks and render had been used on this project? 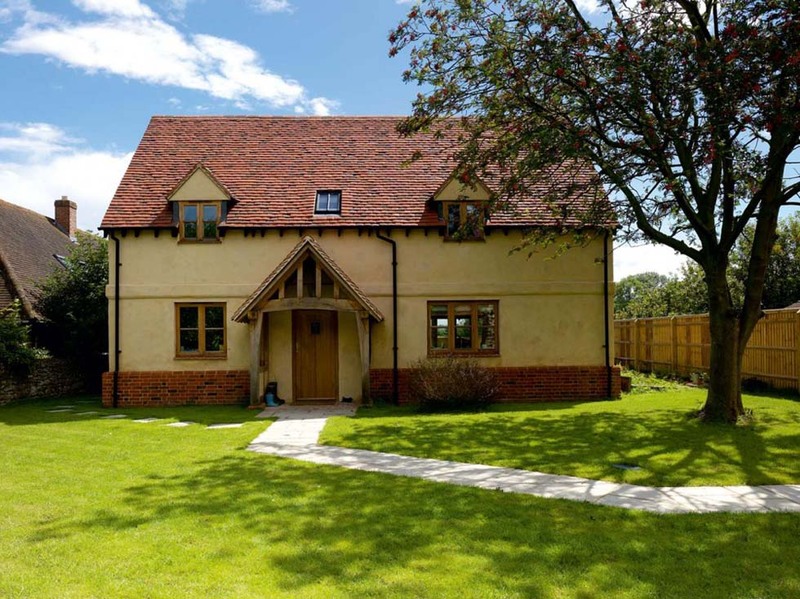 The roof tiles are Heritage Clay, the bricks are from Michelmersh and the rendering was carried out by Simon Gamble, but we have no product details for that. Hi i was wondering if you have the plans with room measurements? I’m afraid we don’t provide more detailed plans to protect the work of the architect. ok I understand that, but can you tell me how many square metres is the footprint? The reason im asking is we are planning a footprint of 70m2 for our 1 1/2 storey house and so am trying to work out how much it was per square metre to see if we can come in budget. In the article it says that the total area of the house is 174m2. I’ve just checked the original article in the print version and it cost £770/m2. However, be aware that this was in February 2008 and costs have gone up since then.